Hi everybody! My name is "B" Rubin and I’m an Ambassador for GWHOC, I’ll be leading this hike. Every member to attend will receive a special Girls Who Hike giveaway! GREEN: Mellow hike, easy to follow, elevation gain of 1,000ft. and under, low altitude. Novice hikers welcome! Parking and entrance is free but they do accept donations. PLEASE DONATE to this beautiful preserve. Oak Glen Conservancy to Wildwood State Park is a 7.6 mile easy/moderate trail. The trail is well maintained with spectacular views through the duration of the hike. The trail does have a steep 700 foot rise in elevation to Preservation Point, at the end of the Conservancy. There are many trails here and opportunities for photo ops. In mid Nov. we should see some pretty fall colors in our surroundings. Please bring anything you feel comfortable and necessary for a day of hiking. All level hikers are welcome. This hike is open to everyone. If you plan to separate from the group, this is not the hike for you. It's going to be a fun hiking family day and I'd love to stay together. 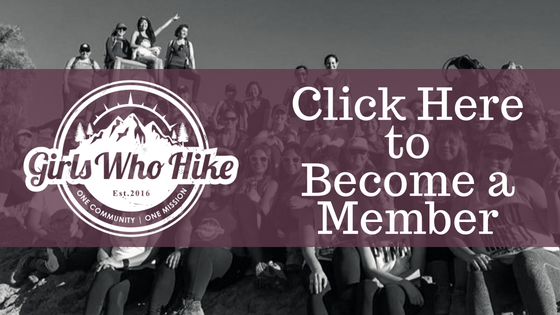 Come tackle the highest peak in Southern California with GWHOC Ambassador Melia! *This is a GWH members only hike, no guys, kids or pets for this one! PACE: Looking to keep about a 2 mph pace. Please take the strenuousness of this hike seriously and always remember it is OKAY to start off with a smaller hike to work your way up to advanced hikes. We will never leave a girl behind on the trail, but please be considerate of our desired pace for the hike as this is a hard hike! Required: 4-5L water, snacks, layers, headlamp, first aid kit, trail map (either digital or physical), sunscreen, and a great attitude! 3. Please read up on the hike & ensure you are prepared for this hike by doing a smaller prep hike, bringing your ten essentials, and a great attitude! This hike is hosted by Ghouls Who Hike Ambassadors Mia Svenson &Brandi M Rubin! Trick or Treat yo self to a fangtastic Halloween hike with all your favorite ghoulfriends! This is a Halloween themed hike - please come in costume, and feel free to bring treats to share! Trail Rating: This is a yellow hike on the GWH trail rating scale. It is moderate but may be challenging for some due to unmarked trails, elevation gain of over 1,000 feet, and distance of over 5 miles. Dogs: This trail involves climbing ladders through tight corridors, please only bring your dog if your dog has climbed ladders before. - This hike involves climbing ladders and going through tight slot canyons. If you are afraid of heights or claustrophobic, this hike may not be suitable for you. - This hike is open to hikers of all skill levels. We’ll be hiking as a group, and nobody will be left behind or forgotten. - Since we won't be leaving anyone behind, we will be taking breaks when they are needed, for as long as they are needed. Unfortunately there is no way to predetermine this. If you plan to leave the group or are uncomfortable waiting for or hiking at the pace of other hikers please do not attend. We will take one longer extended break to eat some treats and hang out. - The drive to this trail involves 1-2 miles of unpaved road. Sedans and cars with low clearance will be able to make it, but should take caution and drive slowly. Last year a honda accord and prius made it with no issue! Any updates will be posted on the event thread via the pinned post, and I'll update the event description if anything changes, can't wait to meet you! OPTIONAL: Car Camping! I'll be car camping the night before in the canyon. It's a wilderness area, so no permits or fees required. You are welcome to join me! I'll create a post in the event thread later so we can plan. This won't be part of the official meet up, but will be super fun. This Hike is led by GWH Ambassador Melia! 3. Read up on the hike + download a trail map. including but not limited to: 2 L water minimum, sufficient snacks, a first aid kit, layers, and a good attitude! Please see the Facebook event for more information! Hi girls~ Brandi here, fellow GWH member and one of your awesome OC Chapter Ambassadors. Thought we might switch things up a bit in Sept. Lets kayak and paddle around balboa island and Newport Beach Back Bay. Its so hard to predict the weather from now until then so I'll just say dress as if you were going to the beach, bring a top layer. If you have a waterproof/dry bag, definitely bring that for your essentials you don't want to leave behind at the kayak center. NO ADVANCE reservations are accepted. We pay upon arrival, it is first come first serve. On their website, the pictures show they have many many kayaks and stand-up paddle boards and since we are arriving as soon as they open I'm sure we can be accommodated. I will have new chapstick giveaways for EVERY member who attends. We can never have enough of that. I plan on getting a single kayak for myself but if you'd like to share a kayak with someone please do. As I mentioned above, please bring the essentials you would bring to a day at the beach; sunscreen, hat, bathing suit,comfortable shoes you dont' mind getting wet, base layers of clothing and a top waterproof layer in case the weather changes temporarily while we are out. Please bring at least 2L of water, if you'd like to bring snacks, please do. I anticipate an hour or two float/paddle session and if you think you may need/want snacks...definitely bring them. Please bring an ID in case they need it for the kayak/sup rental. Bring a waterproof/dry bag if you have one to keep your personal effects in while we are on the water. There is a spot to keep your personal items in the rental center, I choose to keep my gear with me. I will have my first aid kit, if you feel comfortable or want to bring yours as well, please do. Please bring anything with you, that will make you feel comfortable and safe. THIS EVENT IS FOR EVERYONE ~ EVERY & ANY SKILL LEVEL AND INEXPERIENCED ARE WELCOME ALSO. This is an event with minimal physical exertion and ever level of physicality is invited and encouraged to attend. This is a great opportunity if you have been wanting to try either kayaking or sup'ing...the waters will be calm and the day will be beautiful. Event Rating:GREEN: Mellow event. No experience required.. Novice kayakers/sup'ers welcome! 2L of water required. Permits / Passes: Free parking in lot. Rancho Palos Verdes. Lunch at beachfront Hennessey’s in Hermosa Beach for burgers and beers after. Carpool is strongly encouraged. All level hikers welcome!! Paintbrush is a Ridgeline trail overlooking the ocean, no shade, beautiful views with rolling small hills along our path. Shipwreck is also a Ridgeline trail that descends along the cliffs to the beach below. Once on shore, we will walk over small rocks (please wear good grip shoes and watch footing to avoid ankle rolls) to the Shipwreck ruins. Trail Rating: YELLOW: Moderate hike,well-signed, elevation gain of between 1,000-2,000ft., low altitude. Novice hikers welcome! RED: Strenuous hike,possible unmarked trail, elevation gain of 2,500+, altitude up to 9,500ft. Experienced hikers welcome, as well. I am putting the trail rating as yellow TO red because the first trail is moderate (rolling small hills) and the second is a bit more technical as far as grip on shoes goes on trail down to beach from Cliffside path and a bit of small rock walking over constitutes red to me, for your safety, to be aware of. Kids: no, not this time please. These hikes are for all level hikers. Everyone is welcome. My hiking pace is a normal walking pace. We hike as a group and no one will be left behind. Please bring at least 3L of water and any snacks you like to bring on hikes for energy & sustenance. Trekking poles are strongly recommended, but not needed. Please bring sunscreen and a hat. These trails are fully exposed to the beautiful sun. We will end at the shipwreck (on the Rocky beach) before heading back up and going to lunch. So please be mindful of shoes with good grip. Rocks on beach can sometimes be slippery. Also just bring what you hike with that gives you peace of mind and keeps you comfortable. Most importantly, your ten essentials. Going to be a gorgeous day of hiking by the beach. Followed by burgers and beers, hope to see you there! Elevation Gain: approximately 4,000 ft.
2. Read up on the hike + download a trail map. Any updates will be posted on the event thread via the pinned post, and I’ll update the event description if anything changes! If you have questions, please email me at melia@girlswhohike.org if I don't reply to a PM! This is a moderate - hard 11 mile steady climb with an elevation gain of 3,900 feet. This is peak # 3 in the 6 pack of peaks if you are participating in that challenge. Trail head Coordinates: Use this trail head GPS address: Manker Campground, Mt. Baldy, CA 91759 ( Meet at my black tahoe for giveaways/waiver signing/introductions) More specific directions are below. I'd like to keep this hike as a girls who hike member only hike. Dogs: no, not this time please. Men: No thank you, just us girls please. I will secure a day hike permit for us, all that are in attendance. There ARE bathrooms around campground that can be used before/after hike. NO EVENTBRITE TICKET IS REQUIRED for this hike. Just an old fashion rsvp, please. If you haven’t yet signed a GIRLS WHO HIKE waiver, please take a minute to do so by following this link to sign. To participate/attend a GWH event, the waiver must be signed. Good news, you only do it once and it’s good for all future events for the year. I WILL HAVE some printed at the trail head for those who may need it. What to bring; Please bring what you are comfortable hiking with. This can include, but is not limited to; hat/sunscreen/glasses/bug net/bug spray/ layers for variety of weather (it will undoubtedly get windy & cold at some point on our venture) I have yet to hike a peak that didn’t. Please bring at least 3L of water per person, nutrient filled snacks, trekking poles (if you’d like, not necessary) medical or small first aid kit, GPS or map...you can also refer to the 10 hiking essentials, they are not mandatory but recommended and helpful on any and every hike. Most importantly, think of what you would want/need to be comfortable and safe. Then pack and bring along with you! Friendly reminder: This amazing hike is open to all, every single level of hiker. From beginner to intermediate. I am a regular walking pace hiker and would love for us to stay as a group, if possible. Sunset hike to some pretty iconic markers and views in Laguna Beach! This hike begins in Laguna Beach at the top of the mountains at a place called top-of-the-world. There is a nice trailhead here with good parking, bathrooms and water. We descend into the scenic Aliso Wood Canyons Wilderness park along the West Ridge, Cholla and Wood Canyon trails. Down in the canyons there are woodlands and streams and we will visit 'Dripping Cave' an old hangout for stagecoach robbers. We will climb out along the steep and rocky Car Wreck trail. There is a mysterious wrecked Volvo up there we will pass on the climb out and watch the sunset from the Top of the World. Sunset is around 7:45 this time of year! California Orange County - REI "What's In Your Pack?" Please see the Facebook link for more information! This event is hosted by Girls Who Hike Orange County . The first 10 members to arrive will receive special Girls Who Hike giveaways! This is also hike #3 on the City Slicker Challenge! GWH TRAIL RATING: YELLOW: Moderate hike,well-signed, elevation gain of between 1,000-2,000ft., low altitude. Novice hikers welcome! CAN I BRING MY DOG/KID/SIGNIFICANT (MALE) OTHER: no, girls only please! NOTE ABOUT PACE: We will stick together as a group. All paces/skill levels are welcome to join. Please come prepared- this means carrying 10 essentials, carry water and snacks, and have access to a trail map. If you have any concerns about your pace/the pace of the group, please don’t hesitate to reach out to me to chat about it! Make sure you have the GWH Liability Waiver signed and on file! Please review the REI Day Hiking checklist for recommendations on what to bring! If you have any questions about this, please feel free to reach out! EVERY GIRL IS REQUIRED TO HAVE A PAPER TRAIL MAP OR ELECTRONIC VERSION DOWNLOADED! EVERY GIRL IS ALSO REQUIRED TO BE CARRYING AT LEAST 2L OF WATER AND SNACKS. Read up on the trail (links provided above). Please RSVP if you plan on attending. I will also be creating a post within the group on Thursday night to get a final headcount so please keep your eyes out for that!! Climb For Heroes Annual Fundraiser. Meeting at 7AM and no later please! Please read all of this before signing up. There are strict guidelines to register. I am more than happy to answer questions that are not on the website or in this event description. Please take time to read. Our team will most likely be capped at 25 hikers! I will send out a notification when you can begin emailing me to sign up when The Heroes Project has launched the fundraising link! Lets climb Mt. Baldy and raise money for wounded veterans. This hike is open to all GWH members of all chapters but this is a CLOSED GWH event meaning only members are allowed. Also you MUST REGISTER to hike. I will be creating a team for us and other friends where we can all raise money to together so please feel free to share the link. All the funds raised go to The Heroes Project for wounded veterans and all donations are tax deductible. Event check-in and base camp are located at the trailhead at the top of the Mount Baldy Ski lifts parking lot. Check-in begins at 8:00 am and will continue until 10:00 am. Tender Greens restaurant will supply breakfast and the all-important coffee. You just need to bring water, your hiking daypack, a credit card for incidentals, and your fun self. Once you’ve checked in, you can start your hike at any point. Camp 1 will be a mere 30 minutes to an hour from Base Camp). At Camp 1, hikers will receive a coin that will be exchanged for a Heroes Project t-shirt at the end of the day. Camp 2 is located another 45 minutes up the mountain and provides an excellent resting point for refreshments at The Notch (the Mount Baldy restaurant), a picture opportunity, or a chair lift down. Hikers can turn around here, or continue on to Camp 3. At each camp (there are five total – including the summit) participants will receive coins redeemable for goodies at the end of the day. Mt. Baldy is 10,064 feet and a little less than 6 miles UP. Don’t worry, we have our veterans situated strategically on the mountain to provide you with inspiration and motivation. But, you can come down at any point, trade your coins for schwag, and hang out with us at base camp eating delicious food (Tender Greens will serve an after hike snack), enjoying beautiful weather and mingling with really good people. This event is hosted by GWHOC Ambassador Melia Shumate! Join us as we're tackle on Ontario Peak in Angeles National Forest! This peak is a 14.7 mile round trip summit with 4,170 ft of elevation gain and a final altitude of 8,696 ft!! RED: Strenuous hike, possible unmarked trail, elevation gain of 2,500+, altitude up to 9,500ft. Experienced hikers welcome, semi-experienced welcome if they plan on training beforehand! BLACK: Experienced hikers ONLY, unmarked trail/easy to get lost, 9,500ft.+ altitude, 3,000+ft. elevation gain. I will be leading the group, and welcome all girls as long as they're prepared. We will stick together as a group, but you must feel comfortable with some distance between us between markers (such as trail signs, forks in the trail, stream crossings, etc.) due to differences in pace. I will be floating from a sweeper to the middle of the group, so I am seeking a volunteer to help lead! 12 miles roundtrip with ocean views the entire way. This is a relatively moderate hike. Longer distance but not a lot of elevation. Parking is residential and easy! Please bring water and hiking shoes. No dogs allowed on this trail. Join the Orange County chapter for their monthly meetup! Hosted by GWH Ambassador Yvonne.